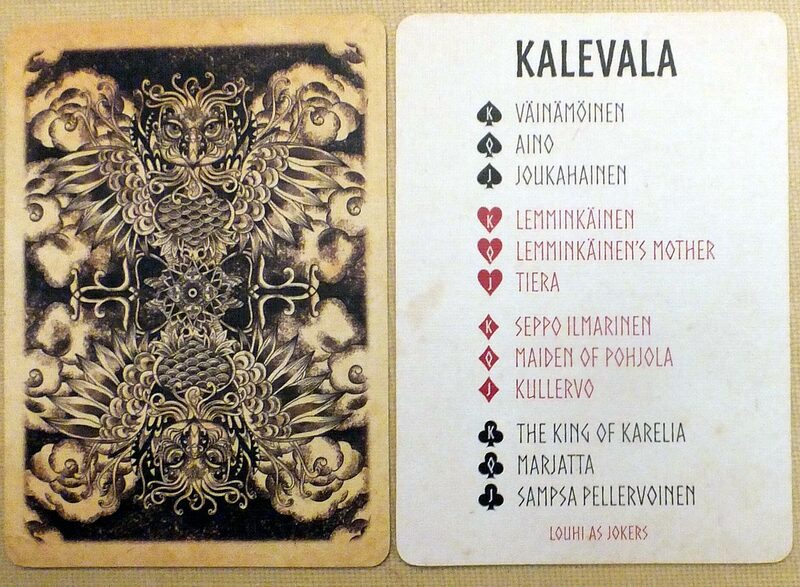 Sunish Chabba’s latest art project, Kalevala playing cards, is inspired by the ancient mythology and folklore of the Karelian and Finnish people. The deck is entirely hand-drawn and depicts the heroes and villains of the Kalevala, the epic poem compiled by Elias Lönnrot in the 19th century and considered an important cultural heritage for the Finnish people. 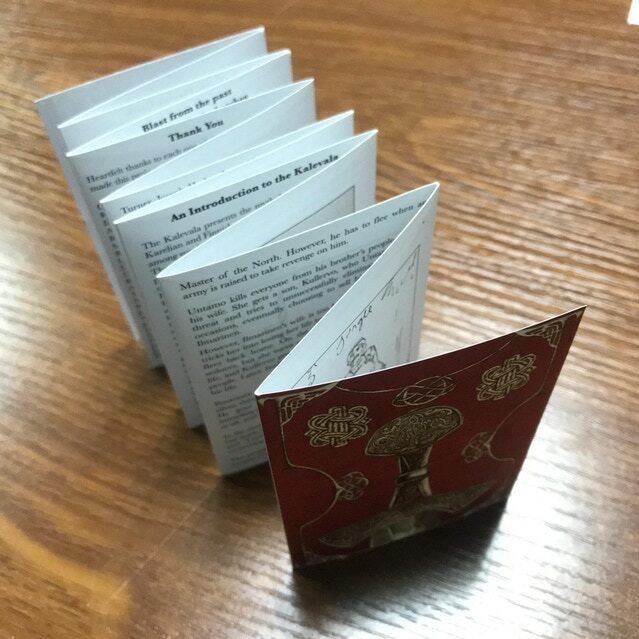 The following notes are taken from the limited print booklet. The central hero, Väinämöinen (K ♠), possesses magical powers of song and music. Aino (Q ♠) is Joukahainen’s beautiful sister who tragically drowns herself as she didn't want to marry Väinämöinen. Joukahainen (J ♠) is an unintelligent young man who arrogantly challenges Väinämöinen to a singing contest which he loses. Seppo Ilmarinen (K ♦) is the Eternal Hammerer and blacksmith who creates Sampo and various other magical devices. The Maiden of Pohjola (Q ♦), the wife of Ilmarinen and daughter of Louhi, is the evil sorceress and Pohjula’s Mistress. Kullervo (J ♦) is a misguided, troubled youth filled with vengence who is sent as a slave for Ilmarinen's wife. The King of Karelia (K ♣) is Marjatta’s son who is later condemned to death by Väinämöinen for being born out of wedlock. The boy, in turn, chastises Väinämöinen and is later crowned King of Karelia. Marjatta (Q ♣) is the King’s mother, a holy woman and virgin who gives birth in a stable to the son who becomes King. Sampsa Pellervoinen (J ♣) is the god of fertility. Lemminkäinen (K ♥) is a handsome, arrogant and reckless ladies man and the son of Lempi. Lemminkainen's Mother (Q ♥) sews together all the pieces of Lemminkainen's body and succeeds in restoring his body. Tiera (J ♥) is the friend of Lemminkäinen and accompanies him to the battle with the mistress of Pohjola. Louhi (jokers) is the sorceress who steals the Sampo, provoking Ilmarinen and Väinämöinen to enter her stronghold in secret and retrieve it. Louhi, in reply, pursues them and combats Väinämöinen. In the struggle, Louhi is vanquished but the Sampo is destroyed.